Are you looking for market indicators? We believe that 2017 will be one of the more challenging years to quickly and correctly analyze and interpret macro events, because we must navigate two major unknowns. Trump/Republican Fiscal Policies (Will they really spur growth?). End of the 30 Year Bond Bull Market (Where will the money go?). First, there’s the unknown of politics from the new Trump/Republican government. They are planning for big, potentially seismic, changes in how the economy is regulated and how corporations and people are taxed. But most likely none of that will go smoothly (relatively speaking), and none of it will emerge unscathed from the Washington sausage-making process. Yet, the implications are enormous. If pro-growth policies are implemented, corporate taxes cut and personal taxes reduced, we could easily see a 10%-20% rally in stocks. Conversely, if these pro-growth changes fall victim to Washington inertia, then this market has already priced in an acceleration of growth… and a 10% correction isn’t out of the question. Second, there’s the unknown of an enormous money flow variable. Specifically, if the more-than-three-decade bond bull market is over, and bond investors are faced with the prospects of 1) Declining bond prices and 2) Rising inflation that will erode coupon payments, where does that money go? Again, the implications are enormous. If the $1 trillion-plus in assets that’s moved into bonds since 2008 begins to funnel into stocks, that money flow might just trump all the fundamentals and cause a rally that will push stock prices higher on a purely nominal basis (the trick then becomes relatively outperforming). On the other hand, if the money stays in bonds or goes to cash or real estate, then stocks might not catch that massive tailwind. So, to watch the evolution of both trends, I’ve identified two leading indicators that should give us needed insight into how these trends are evolving. As mentioned yesterday, they are Trump’s approval rating and the Semiconductor Index. Where to find it: Restricted for Subscribers. Rationale: Love him or hate him, the reason the Republicans have a majority in Congress and the presidency is Trump. So right now, he is the boss. 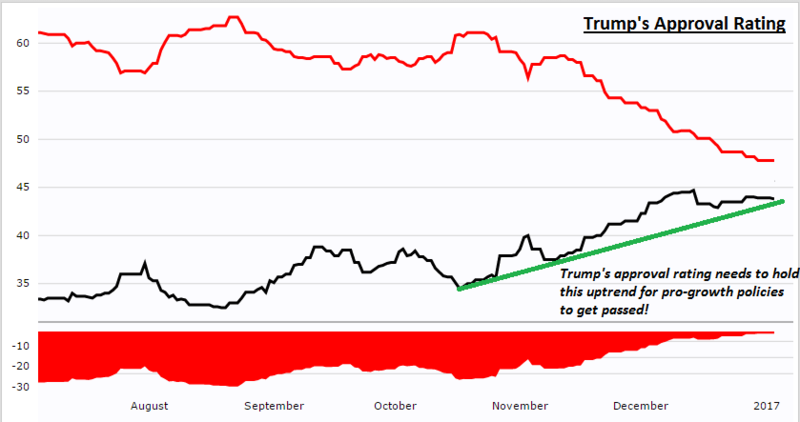 Yet he also remains historically unpopular for an incoming president, and given that he and the Republicans are planning potentially massive overhauls to regulations, taxes, Obamacare, etc., fickle politicians will be quick to jump ship if Trump’s approval ratings begin to decline… and that means scaled back, or no pro-growth measures, which is bad for stocks. Rationale: For all of 2015 and 2016, I called the “FANG” stocks (FB/AMZN/NFLX/GOOG) “rental long” positions, because when portfolio managers wanted to quickly add liquid stock exposure they bought those stocks. It had nothing to do with the actual business fundamentals, they were just higher-growth, liquid companies that could ride a rally. 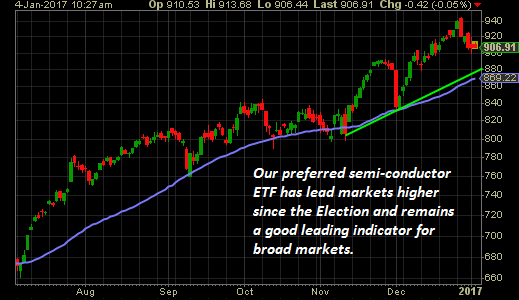 Well, it appears those names have been replaced by a more pro-growth sub-sector of tech, semiconductors. Semiconductors handily outperformed the markets post-election, with the sector rising 13.5% from Nov. 8 into year-end for a 2016 gain of 38%. Additionally, it wasn’t until the semiconductors dropped sharply on Dec. 28 that the market could generate any actual downside, again anecdotally implying it’s an important momentum sector. Bottom line, if we see money start to stream out of bonds and into stocks, it may well find a home in the semiconductors, due to 1) A compelling long-term investment thesis (the Internet of Things), 2) Liquidity, and 3) Exposure to growth. Now, I’m not saying all the money will flow into semis (obviously), but on the margin, if what we saw in Q4 is going to continue we should expect the semiconductors to outperform. Bottom line, the macro outlook has improved in 2016 but that’s left a wide gap between market expectations and the likely reality, and that gap can cause air pockets in stocks like we saw three separate times in 2016: Jan/Feb, Brexit, US election. And, we’re as committed to helping our subscribers navigate these looming events as we were with the Brexit vote, the election, etc. Click this link to learn the two specific leading indicators that we believe will help us outperform in 2017 and start your no-risk subscription. This entry was posted in Market Commentary, Market Events & Reports, Stocks and tagged market indicators. Bookmark the permalink.